Sant Ravidas, a Hindu social reformer, openly challenged social inequalities and evils like the caste system and untouchability. Sant Ravidas Jayanti 2019 date is February 19. Guru Ravidas Jayanti is the birth anniversary of this great saint and social reformer. The pious soul was an ardent devotee of Sri Ram and his compositions inspired the Bhakti movement in North India during the medieval period. 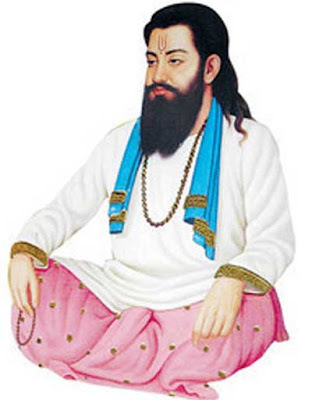 Sant Ravidas is the founder Guru of the Rai-dasis Sect, also known as Ravidasi. Several Hindu sects consider him as Sant and the Sikhs consider him as Guru Ravidas Ji. There are 41 verses of Sant Ravidas in the Sikh Holy Book, Guru Granth Sahib. It is popularly believed that Sant Ravidas was born on the Maghi Purnima day in 1376. From childhood, he showed inclination for spiritual activities. He carried this zest of spirituality all this life and spearheaded the fight against discrimination based on caste and preached the idea of equality. Or even the tool to cut the thread. While I, who do not knot, break free. And death keeps his business to himself. Through the way of devotion, the intellect is imbued with Truth; doubts, entanglements and vices are cut away. When I am in my ego, then You (Lord) are not with me. Now that You are with me, there is no egotism within me. And this toddy tree you consider impure, since the sacred writings have branded it that way, but see that scriptures are written on its leaves.